If you come to attend a Vesper service or the Divine Liturgy, chances are that prayers are already read as you enter the Church. These are called the prayers of the Hours. 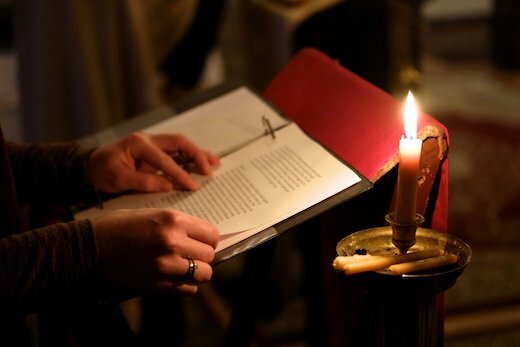 The Hours are four relatively short prayer services of the daily cycle, which are connected with specific hours of the day. In ancient times the day was separated into eight watches. The early church used to start each of these watches with a specific service, which made up the daily cycle of services. • The Evening Aggregate usually consists of Ninth Hour, Vespers, and Compline. It commences shortly before sunset. • The Dawn Aggregate usually consists of Midnight Office, Matins, and First Hour. It usually begins shortly before sunrise. • The Midday Aggregate consists of Third Hour and Sixth Hour. The Divine Liturgy or Typika are often included in the Midday Aggregate. Thus you will notice that the First Hour is read immediately following Matins. The Third and Sixth Hour immediately precedes the Divine Liturgy, and the Ninth Hour immediately precedes Vespers. • The troparion of the day is chanted. • The theotokion and Psalm verses of the Hour are chanted. • The Trisagion Prayers are prayed. • The kontakion appointed for the Hour is chanted. • The Prayer of the Hours: “Thou Who at all times and at every hour…” is prayed. • The final prayer appointed for the Hour is prayed.